Caliber Consulting helps companies improve operational performance to make significant impacts on the bottom line. Optimizing operations is a major challenge considering the complexity in today’s globalized world. We deploy a pragmatic approach which focuses on the big ticket items that impact performance the most and have a sustainable effect on performance. With a sharp focus on speed, flexibility, and efficiency we make a mark on the organizations that we work with. Moreover, we are experts in translating strategy into operations and making it more actionable and deployable across the organization. This integration which bridges the gap between strategy and operations is critical for effective strategy implementation in organizations. 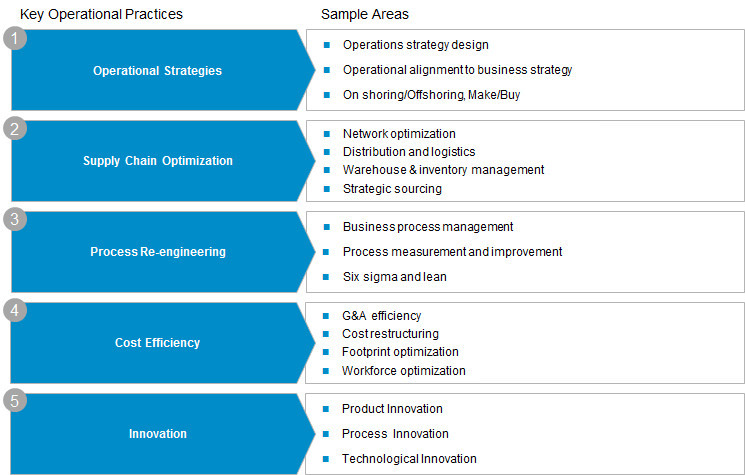 Our range of offerings on operational consulting is diverse, however, there is a focus on five key operational practices. With a clear corporate strategy in place and communication initiatives rolled out to all employees, it was time for this large industrial services player based in the GCC to enhance its execution capabilities. This was done with the formulation of an operational plan aligned to the 3 year strategic plan, and further alignment of budgets to the strategic initiatives undertaken. In addition, operational dashboards were rolled out to better measure and monitor the operational functions. In addition, monthly operational reviews were implemented that fed directly into the quarterly strategic meetings to ensure the elusive bridge between strategy and operations was made effective. With improvements in procurement and other logistics functions made at this leading retailer, the focus shifted to warehouse operations. Firstly, the warehouse layout was redesigned to optimize travel times through a redesign of the physical structures in the warehouse and a focus on optimally storing high velocity skus. In addition, slotting was re-configured to be aligned to replenishment levels. Standard operating procedures were also developed for all warehouse function including shipping, receiving, assembly, and forklift. Finally, labour productivity standards were put in place to better drive individual performance and promote accountability, leading to warehouse productivity gains of over 25%. With a new vision and strategy set for a mid sized healthcare provider, it was time to review its current as-is processes in the organization. The first step was to map all the current processes and check their alignment to the new strategy. It was discovered that, certain strategic objectives did not have any processes enabling their achievement. In addition, on the flip side some processes did not impact the strategy and consequently needed to be reconfigured. Once these strategic gaps were assessed more process-oriented gaps were identified through benchmarking and evaluation of process performance KPIs. With strategic process and operational process gaps identified re-engineered processes were designed and their implementation overseen.